Fritz Lang (5 December 1890 – 2 August 1976) was a Austrian director, screenwriter, and movie producer. 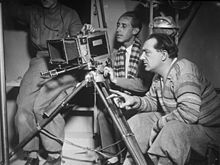 His movies include Metropolis and M. He is one of the most famous German expressionist filmmakers. Lang was born in Vienna. He died in Beverly Hills, California. This page was last changed on 22 November 2016, at 16:42.